Other distinguishing features: Right eye appears to be bionic. Story: Marcus Langston grew up in a poor family with a violent junkie father and a streetwalking mother. One day in 1958 his father came home with magical book he had stolen from Sam Smith. He believed the book was worthless and gave it to Marcus. Marcus read the book and found his own story. In this story he was a looser who ended up getting killed while robbing a liquor store. Marcus didn't like the story and changed it . In 1981 Marcus was contracted by the government to create an exoskeleton for military purpose. Together with Elizabeth Hughes, he succeeded in developing the first prototype . Because he wanted to impress Elizabeth and because he couldn't let anyone else risk their life testing the suit, he wore the suit when it was demonstrated for the military. After the demonstration and the realization of the suits potential Langston made a deal with the military, allowing him to keep the suit provided he continued the development of exoskeletons . While developing the suit Langston and Elizabeth developed feelings for each other, and ended up being married . When the government started the Youngblood program, Langston was asked to join as the first member. He humbly accepted and took the codename Sentinel . 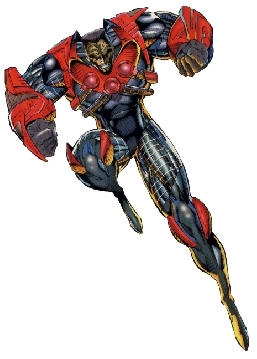 Langston was the field leader of Team Youngblood for a long time but was ultimately replaced by a younger version Sentinel II . His freedom only lasted a short time. With the disaster of Crypt's attack killing several heroes, Langston was soon back as a member of Youngblood . During a Youngblood barbecue at the Langston household, Riptide found her fathers magical book on Langston's shelves and took it. When Langston realized who had taken the book, he went to Riptide's room, while she was out walking, to take it back. Unfortunately Riptide came back early and surprised him. In the following fight, Langston killed Riptide in cold blood, and tried to frame Knightsabre for the murder . Langston's plans, was revealed by Toby King who found the book, and he was put in the Hell of Mirrors in Supreme's Citadel . Equipment: Langston has no powers. His exoskeleton gives him increased strength, speed and flight capability. The armor also contains wrist blasters and force field generators. The armor runs on a miniature fusion generator implanted in Langston's chest .